When you think of beauty products, you don't always think about the male point of view, but that should totally be changing, because they have some great tips. 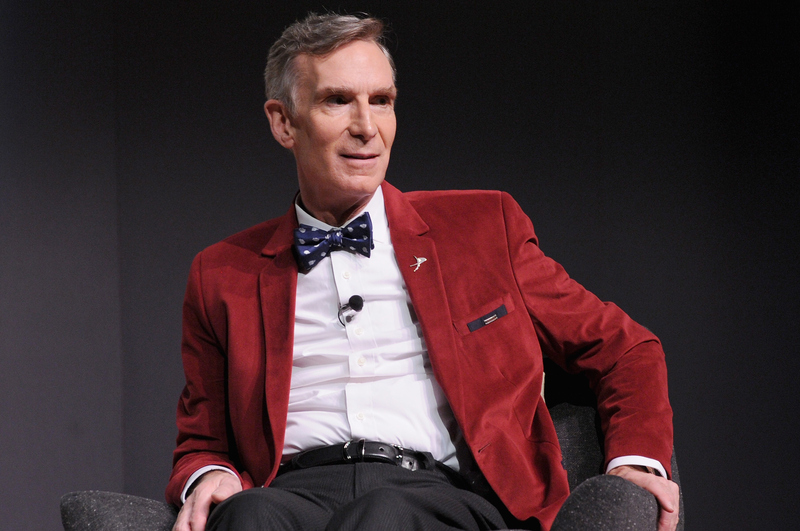 According to an interview with Fashionista, Bill Nye uses Mary-Kay products. Yes, you read that correctly. You might remember Nye from his amazing television show Bill Nye The Science Guy, and now he's using his expertise to call out some of his favorite beauty products. He opened up to Fashionista's Eliza Brooke about his skincare routine even weighed in on some most popular beauty — from a scientific perspective, of course. It turns out that he's loyal to his under-eye cream. Who knew? "What happened was, when I used to work in the shipyard — and you may not associate shipyards with skin care products — but the girlfriend of a guy I worked closely with started selling Mary Kay," Nye tells Fashionista. "I don't know much about Mary Kay anymore, but in those days they had men's products. It was this new thing. She sold me on eye cream, or eye ointment, or whatever that is. And I just got in the habit." Nye goes on to name Olay and The Art Of Shaving as two of his favorite brands. He even attributes twice-daily applications of the eye cream to his great looks. As for his other advice, Nye air dries his hair and wants you to do the same. He suggests using a cotton towel. Who knew that he was such a beauty expert? Never underestimate the men in your life — you never know when they'll come out with some great tips. I'm a firm believer that makeup and skincare is for everyone, so why not take beauty advice from men? There are plenty of male celebs that have amazing skin, hair, and even nails. Check out what these other famous guys had to say about their beauty routines, plus the products they swear by. According to Marie Claire, Matthew McConaughey is a firm Clarisonic believer and has used the device for almost a decade. Considering how gorgeous his skin is, you might want to put this one on your holiday wish-list. When you're married to Angelina Jolie, I guess you're bound to pick up some valuable tips. Fresh Beauty found that Pitt uses an energizing toner each morning, and although it's a tad bit pricey, it's known to banish signs of fatigue almost instantly. Sign. Me. Up. Surprise, surprise: Channing Tatum steals his wife's beauty products. She said in an interview that he especially likes her La Mer cream. The singer is know for his hair, so it only makes sense that he uses something fancy to maintain his look. According to The Cut, Bieber uses Unite Luxury shampoo and conditioner to keep those locks looking fresh. According to PopSugar, Beckham's favorite hair product is Hanz de Fuko styling powder. From the looks of the sports star's fabulous locks, this product is definitely worth the money. Details found out that Justin Timberlake's Sonicare toothbrush is his go-to. I'm a firm believe in a good toothbrush, so this just makes sense to me. According to InStyle, Chris Pratt loves moisturizerizing renewal cream, which helps his skin look hydrated in front of the camera.